Make the best tasting use of leftover turkey, stuffing and cranberry sauce by making Turkey Gobbler Quesadillas with Larry’s Mole Sauce.Turkey and mole sauce are often served in Mexico and so are quesadillas. Why not serve them all together? For each serving, place one tortilla in a grill pan or skillet, sprinkle with cheese. Place a cover on the skillet and cook over low heat unitl the cheese melst. 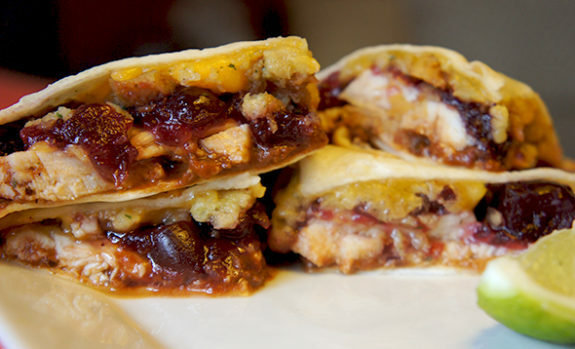 Laer 1/4 cup Larry's Mole Sauce,turkey, 1/4 cup cranberry sauce and 1/4 cup stuffing over cheese. Cover with another tortilla and press down with spatula. 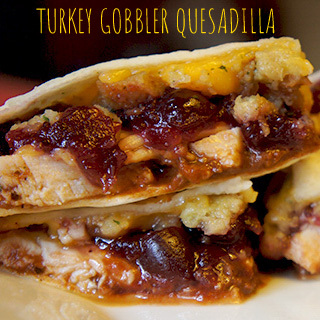 Flip the quesadilla with a spatual to lightly brown the other side. Put the cover on again and cook until all the ingredients are warm, about 1 minute. Remove to a warm plate, cut in half or quarters and serve with a wedge of lime. Repeat to make four servings.